Sukup - Grain Dryers - Stacked Grain Dryers by Sukup Manufacturing Co.
Axial fan stacked dryers can run in full heat or heat/pressure cool mode. You can easily switch from full heat to heat/cool mode with just a touch of a button on the QuadraTouchTM controls. Centrifugal stacked dryers use vaccum cooling. They can run either full heat or heat/ vaccum cool. Centrifugal fans are quieter than axial fans and perform better in the higher static pressure conditions that exist with vacuum cooling. Hybrid Dryers use an axial fan on the top module and a centrifugal fan on the bottom. The hybrid dryer is a more economical way to reap the benefits of the full heat - vacuum cool dryer configuration. The top module is equipped with an axial fan and always runs in full heat, so you use less horsepower to get the same airflow. The bottom module is equipped with a centrifugal fan which allows you to vacuum cool. 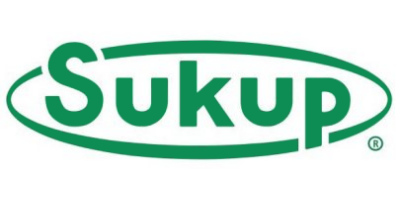 Sukup developed the patented Grain Cross-OverTM System to help eliminate overdrying and balance the moisture content of dried grain in a stacked dryer configuration. Innovative system switches grain from one side of the dryer to the other as it passes from module to module. Balances exposure of each portion of the grain to adverse weather conditions, such as cold wind and/or rain. Also switches the grain from the inside of the column to the outside. Prevents grain from overdrying and gives more consistent moisture content. Reduces variation inmoisture content between the inner and outer portions of the columns, as well as between the two sides of the dryer. The QuadraTouchTM is the simple-to-use touch screen control system used on all Sukup Grain Dryers. Designed to eliminate around-the clock monitoring and increase productivity and efficiency. Click here to see the QuadraTouchTM in use. Click here to see the Sukup Quad Metering Roll System in action. Low-speed axial fans are quieter than traditional axial fans used for in-bin drying and aeration because they run at half the speed. Sukup Centrifugal Dryers are available in a double-stack configuration that allows you the flexibility to operate in full-heat or vacuum cool mode. Top module always operates in full-heat mode. Bottom module can operate either in full-heat or pressure heat/vacuum cool mode. Panels within the plenum area are easily removed or replaced to switch between modes. Louvers open completely for full-heat drying. Louver openings are variable to adjust output grain temperature during pressure heat/vacuum cool drying. A video that promotes the upcoming 50th Anniversary of Sukup Manufacturing along with a review of the new equipment and changes in the plant that have taken place over the last 12 months at Sukup. Side by side comparison testing performed by Sukup Mfg using a Sukup TC163 grain dryer and a Super B SQ20 grain Dryer. The testing was performed on November 16th and 17th 2011. This is the annual installment of what we`re up to here at Sukup Mfg Company in Sheffield Iowa. Check us out! No reviews were found for Sukup - Stacked Grain Dryers. Be the first to review!